The camera CONTOUR PLUS ™ revolutionizes the video board sport you're shooting your exploits with the route (GPS position, km / h, altitude). 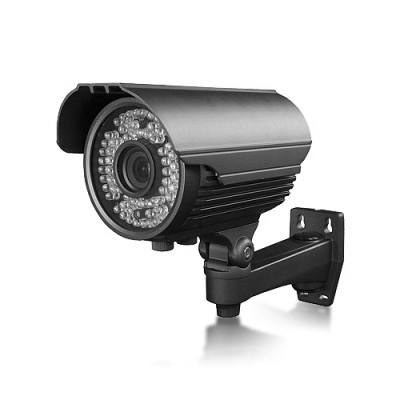 H264 DVR audio / video with a resolution of 1920 x 1080 Full HD 1080P authentic elegant design resistant aluminum gives a good robustness. Thanks to its patented T-Ride ™, the camera PLUS ™ Contour (Contour +) easy to attach to compatible media: Support helmet, mask, board, handlebars, vehicle options on this page. A photograph taken can be done on a mode change in 5 megapixel is one to one is a setting mode to the second edition (in increments of 1, 2, 5, 10, 30 or 60 seconds). 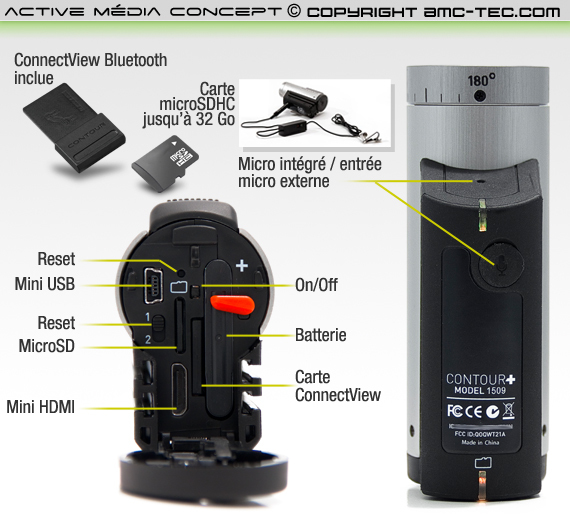 Small and lightweight (150 grams) camera Contour + loads a portable HD video camera and a GPS data receiver. With their software you can set the contrast, exposure, and the microphone gain of the camera Contour Plus. In terms of battery built into the camera contourgps autonomy of 3 hours continuous recording. 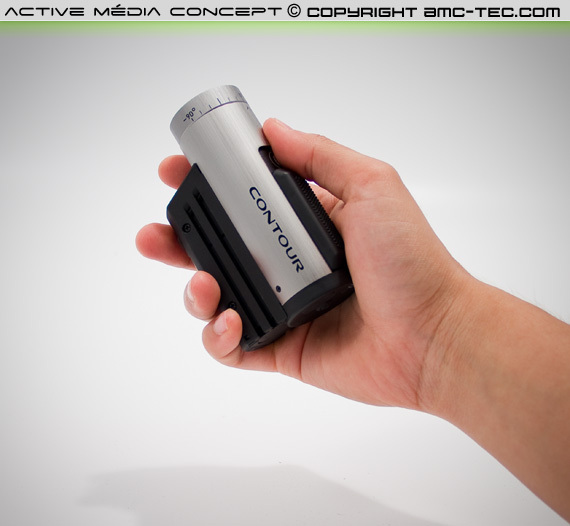 The Contour + has a 270 ° rotating lens. Very easy to use: Just drag a button Oversized (accessible even when wearing gloves) to start recording or take several photos. A GPS receiver is built into the camera PLUS ™ Contour (Contour +) you will record your position (latitude longitude) several times per second with an accuracy within one meter, so it is able to save your position, speed in km / h and vertical drop while keeping portable. View your route via the interactive map Google Maps ™ and the video shoot. You can then compare to your old statistics. View the map Connect will be installed in the camera. 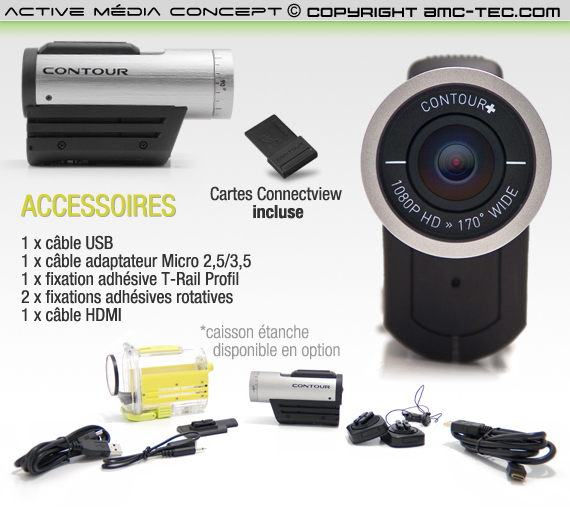 With this Bluetooth adapter, connect your camera ContourGPS, you will see live what the camera sees and you can also access the settings of your camera ContourGPS via Bluetooth. An application that you can find on the Appstore here: "Contour Camera" will give you the preview screen on your iOS (iPhone, iPad, iPod Touch). 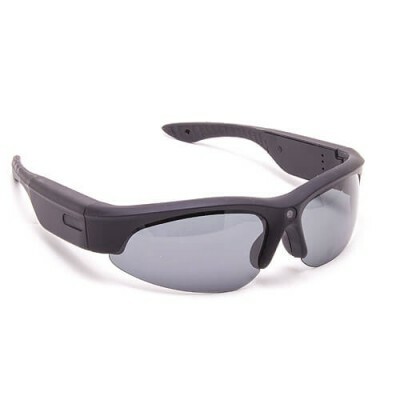 Line up your camera, view the battery life, and see if the GPS is activated from your mobile phone! With the new application Contour you can even change the settings of your camera in real time! Know the recording settings, choose your video mode, adjust the microphone sensitivity, change the sensitivity of brightness, or turn your GPS. 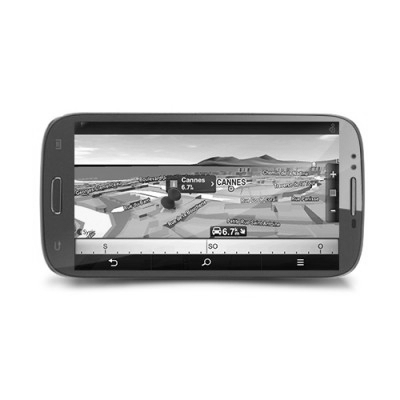 Each time you connect your ContourGPS with the mobile application, it automatically updates with the latest satellite information with GPS AssistNow, which gives quick results and a GPS satellite lock in more accurate. 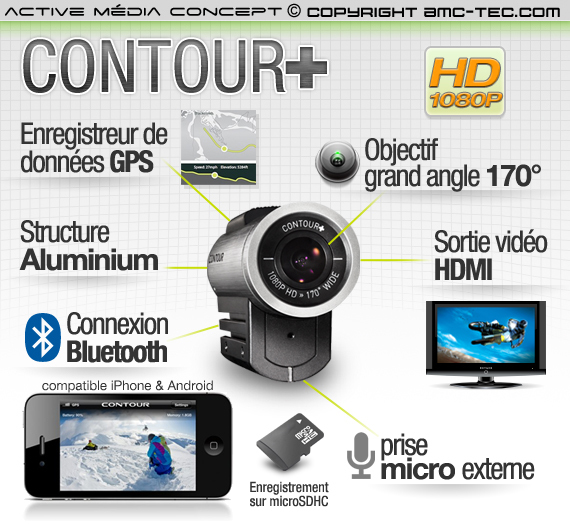 Contour + camera captures video of a Full HD 1080p quality. With its wide-angle and 170 ° rotating lens, this camera offers high image quality and you will capture the entire scene to film with minimal distortion (reduced effect Fish Eyes). However, you can choose between five video resolutions and photo mode. 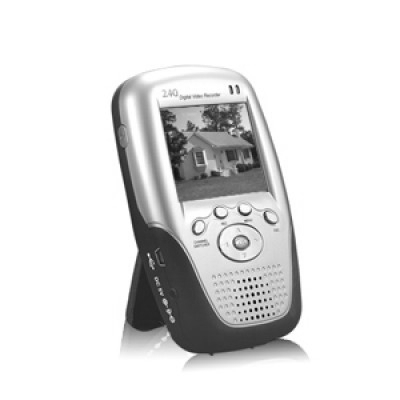 The device also has an HDMI video output to view real-time images from the camera. 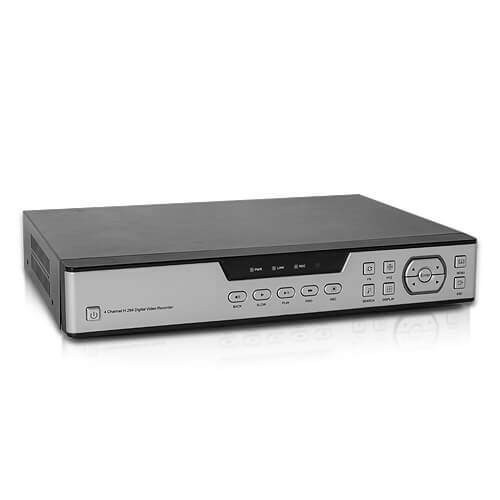 Full HD - 1080p: 1920 x 1080 pixels / 30fps / 15 minutes per GB: For the best quality to fill the larger TV screens with high definition images (such as Blu-Ray). Tall HD - 960p: 1280 x 960 pixels / 30fps / 15 minutes per GB: for sports like surfing, where a large image gives a better rendering. Action HD - 720p: 1280 x 720 pixels / 60fps / 15 minutes per GB: when the rate of frames per second is more important than resolution, this mode is ideal for filming earlier actions, it reduces the blur and distortion of the image. Perfect settings for slow motion of a quality and exceptional smoothness. 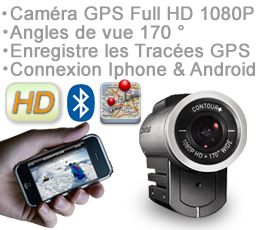 True HD - 720p: 1280 x 720 pixels / 30fps / 30 minutes per GB: This mode is not greedy in memory, this will allow you to film your longer trips. Photo Mode: 2592 x 1944 pixels choose up to 6 shooting speed every 1, 2, 5, 10, 30 or 60 seconds The key to taking pictures! 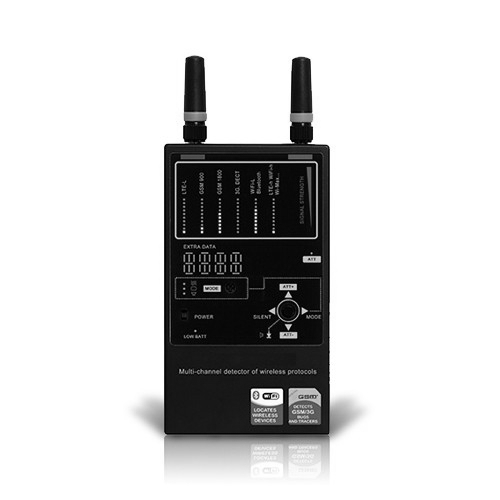 Developed by engineers, the new omnidirectional microphone captures sound and reducing wind noise while keeping intact the sounds that you will hear every whisper, AAC audio compression is used for better rendering quality in sounds. In addition the new camera has a contour external audio input for connecting an external microphone. It is protected by a flap resistant to dust, water spray. Of course you will watch your route on Google Maps ™ interactive map and check your stats and performance. A community is offered in order to share your favorite moments most extreme filmed with the camera. To broadcast your exploits? Visit www.contour.com for sharing videos, stories and map data with the community CONTOUR.